In the past, in our North American culture, power and authority in an organization was held by those who earned the most money, had the titles to go along with their authority, and they had the right to make decisions about where they went, when they went places and who they associated with. They also had the power and authority to decide what others did and didn’t do in their work environment. That was in the past. Where we are headed in a more unified and equal culture, based on principles of collaboration and understanding is that power is now more equally distributed. Those who didn’t have access to education now do. Those who were previously barred from environments of wealth and prosperity are now welcomed in. Corporate cultures, and organizational models across the board are changing and it’s good for everyone. The biggest challenge in any change arises when someone’s fear of being excluded is realized. The issue is no longer about money or time or integrity. The issue is that as work environments change, old (mostly unconscious) patterns of exclusion are changing too. It means janitors associating with doctors and delivery teams eating lunch with those in leadership (imagine that!). When an organization is going through a transformation, when they notice behaviours which were limiting and exclusive and change them, they are actively contributing to an ever-advancing civilization. They are creating a new and inclusive culture. At times, mistakes will be made. Old ways will sneak their way back in and one or more team member may get snubbed or excluded for one reason or another. This happens. It’s normal and is part of the learning process. 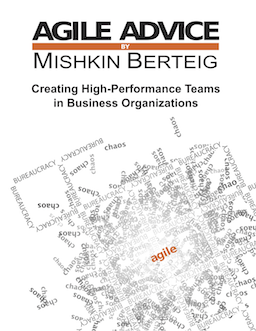 But in time, the aim for any agile team is to continually make these old exclusive unconscious habits conscious so that work environments can continue to embrace a greater diversity of people, not just of cultural backgrounds but from different social and economic backgrounds, too. The difference in life experience from someone who has lived in poverty to someone who has lived in wealth is as if they grew up in different worlds, even though we inhabit the same earth. Everything is different. Language. Behaviours. Hopes and Dreams. Everything is different on any level. However, just as different races are now joining together in work and in marriage more often, so are people from different socio-economic backgrounds coming together too, in work, in community building, in families. The pain of the growth is a worthwhile investment into a brighter and more unified future not just for us but for the generation to follow us. To me, Agility’s the structured pack of the best, the most efficient habits that have been used for years by the best managers, even when the tools hadn’t their Agile names yet. Like Kanban board created with sticks (https://pl.pinterest.com/pin/517491813403216958/ ) and now put into computer. So the thing you write about – transfering unconscious habits into conscious ways of working is the thing I observe every day, especially when I hear my older colleagues stories.